This year’s modification and improvement is a new gallows for the foresail. The previous one was a temporary build from spare 2×4’s. Sturdy enough to get me across the Atlantic. That was 5 years ago. The problem with the temporary design was that the foresail sheets would get caught on the windward side when gibing. The only solution was to go on deck and move them off by hand. The new design is curved inwards so the sheets slide up and over when gibing. I have also introduced a dip in the top centre so the furled bundle can sit in it snugly when the topping lifts are slacked. 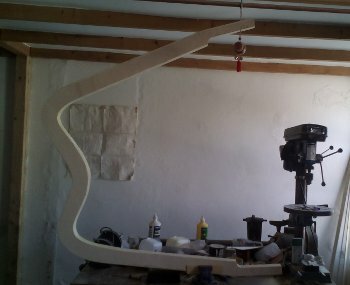 It can then be held firmly in place by tightening the sheets. This element seems to work well and am already considering building a similar gallows for the mainsail this winter. As you can see in the picture, the fore sheets touch the gallows when the sail is fully extended, although this doesn’t seem to cause undue strain or problems. 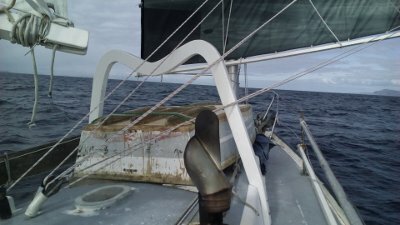 I have discovered that it is virtually impossible to sail goosewinged (main and foresail sheeted out to different sides of the boat) directly downwind. This is because the larger main creates a wind shadow in the foresail area. The foresail just flaps about from side to side as the boat rolls. The only way I can sail gooswinged, utilizing the benefit of both sails downwind, is to sail with the wind coming from the aft quarter that the foresail is set. This allows both mainsail and foresail to to be fully flush with wind. The ability to sheet a sail right out and squared is a huge benefit of junk-rig sails. It allows one to sail off the wind with a wide range of angles without needing to gibe too soon. Below is a short clip of sailing goosewinged in this manner. Although you cannot see he wind, you can imagine it coming from the aft starboard side of the boat. Works like a charm. goosewing from Simon Foster on Vimeo. We are currently hanging out in Lochinver doing some maintenance and waiting for a suitable weather window to sail north Norway bound. 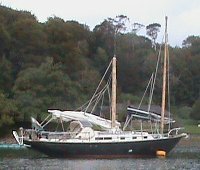 After 18 days of sea I arrived in Crosshaven, Eire on 10 September and am currently moored at Drake’s Pool – a secure spot I have visited twice before. The good news is that we made it and I can now start to look for a replacement main mast this winter so we can be up and running again in the spring. The not so good news is that it was a bit of a rough ride out there and had to pass through two gales and one storm. (A far as I’m concerned a gale is a minor storm and a storm is a major gale). Apart from being strangled by the sheets in an unexpected jibe I received no injuries (and the rope-burn scab on my neck should be gone in a few days 🙂 ). The broken main battens was a design fault. They were both made of two aluminium tubes joined together with a wooden plug and then the join covered in a 10 foot PVC tube. The PVC tube had too much flex allowing the aluminium tubes to snap the wooden plugs. It was then only a matter of time before to two now separate tubes stressed the PVC to breaking point. After the second broken batten I replaced it with a single length of aluminium tube and had no more failure. 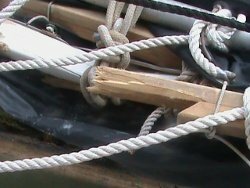 That’s a broken batten and boom tied together your looking at. The broken foresail boom was snapped by …? … getting jammed in the bow pulpit I suspect. Now it should not have been able to get into that position but it must have slid forward under duress, got caught and snapped with a quick jibe. I tied the boom to the wooden batten above it and sailed with one less panel. 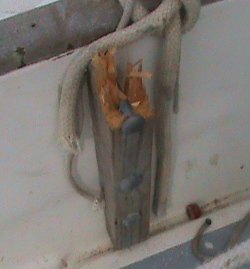 A gale or two later I noticed that that batten had been cracked at the same place and tied them both up to the aluminium batten above sailing with two panels out of action. 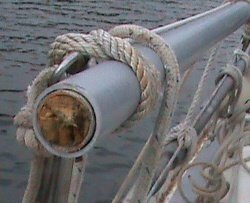 I have some clear ideas on how to prevent this in the future including reducing the sail balance, raising the mast lift height, and using a boom parrel as well as a boom/lower batten luff parrel. That’s pretty much all that’s left of the main gallows! The main gallows were wiped out in the blink of an eye during an accidental jibe. Of course the boom should have cleared the gallows by a few inches but I can only suspect that the topping lifts had stretch a little allowing the sail to sag and the boom caught the top of the gallows at full force, cracking the boom and sending half my gallows into the Atlantic ocean. Not a big deal really cause gallows aren’t essential, just good to have around if you need to make repairs and need to secure the sail. My one bolt crane solution worked remarkably well. On one end I hung the halyard block and hung the two sides of the topping lifts off the other. 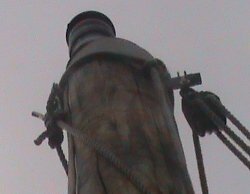 The mast lift was secured by a bowline slung over the top of the mast secured by the bolt from slipping down. So not all my designs are crap! I took a few video clips of my journey from Charlottetown – St John’s – Crosshaven and mashed them all together last night and uploaded them to MeTube. If nothing else it displays the fact that I am better sailor than a cameraman or video editor. But it’s just a bit of fun for me. The “test pilot crew” in Charlottetown is photographer Astrid from Hamburg on the left, Bonnie from Charlottetown on the helm, and Rachael from the Welsh borderlands sitting on the right. Brave women! Thanks.